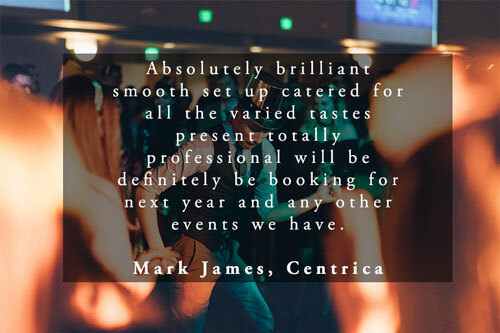 Put simply, London is one of the world’s most iconic cities. 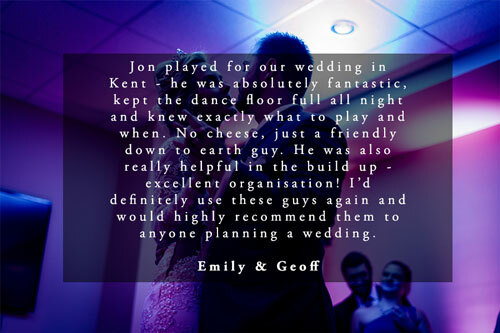 It is home to every kind of wedding venue you could imagine, and is capable of delivering any wedding style you could wish for. 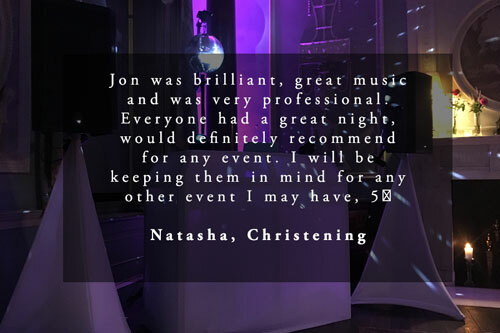 Whether you’re holding your wedding at a glamorous London hotel, a relaxed and retro warehouse or a theatre steeped in history, we can provide you with the very best wedding DJ London has to offer. 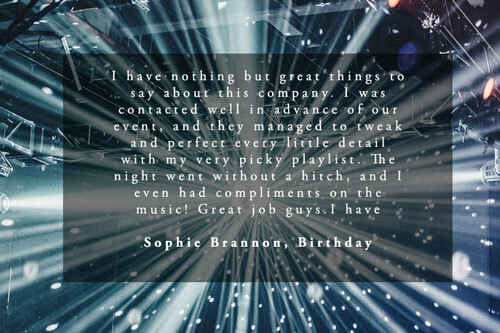 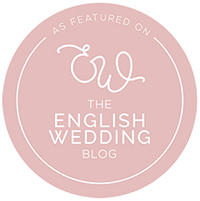 As a well-respected DJ company that has provided the entertainment for countless London weddings, we know that every single celebration is different – and we ensure that we create something unique and special for all of our clients. 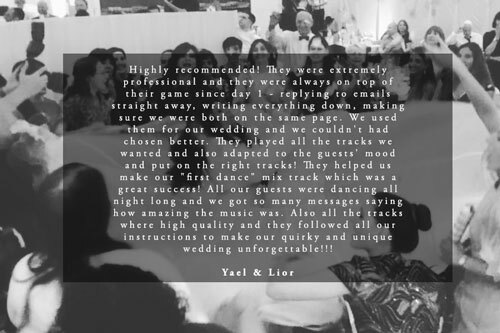 We take great pride in putting your needs at the forefront of everything we do – from selecting the right DJ, through to making sure that you and your partner only hear the music that you (and your guests) want to hear on your wedding day. 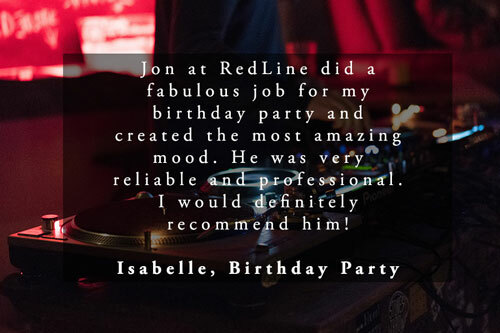 No genre is too strange and no song request is too left field – we will work to make sure your night is brilliant fun, and stress-free. 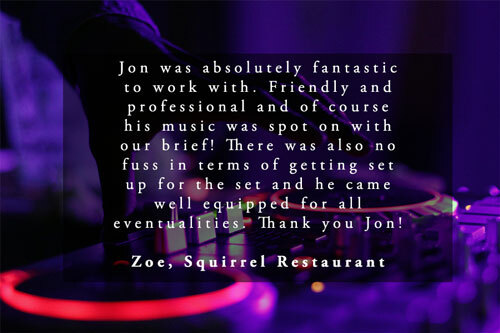 Our DJ roster contains many of the the most talented and professional London wedding DJs, and each one of them is dedicated to making sure they deliver the perfect wedding for you. 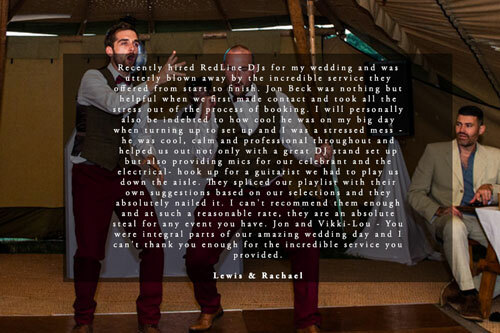 In short, our aim is simple – to make your wedding day truly unforgettable, and help you to throw one hell of a party! 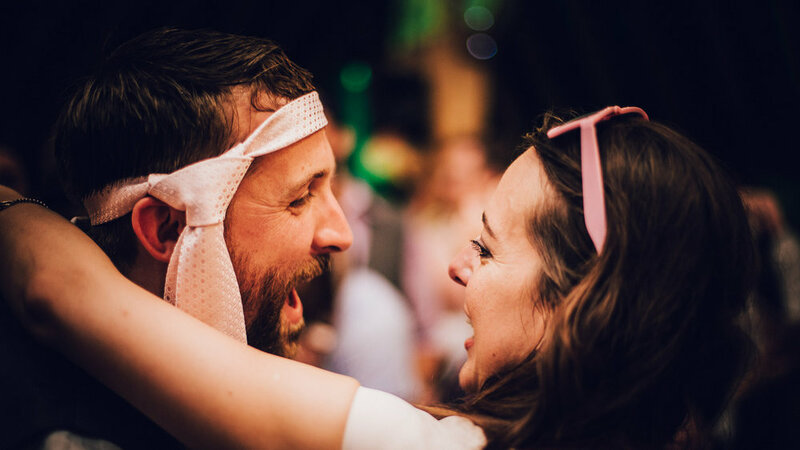 The stereotypical cheesy DJ is still an enduring fixture at many weddings. 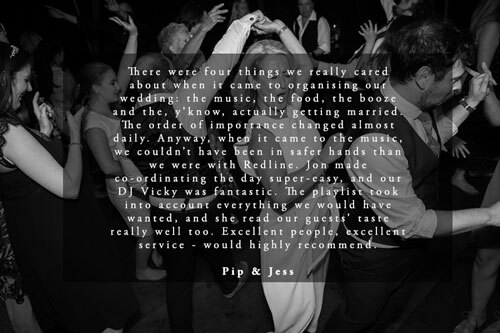 This is not us! 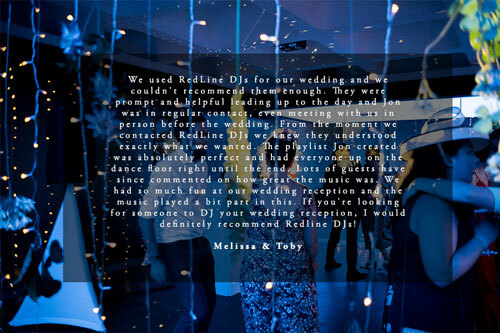 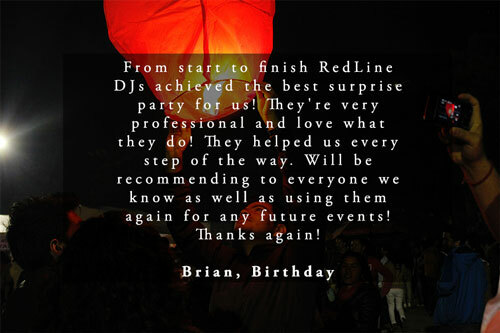 At RedLine DJs & Entertainment, we are on a mission to ensure that bad wedding DJs are a thing of the past. 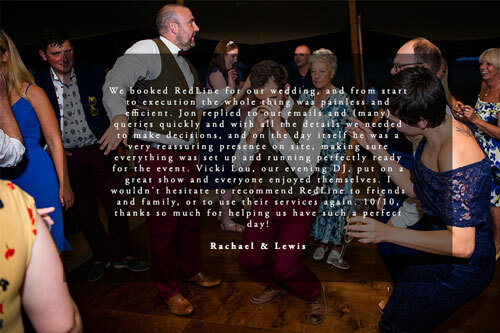 Instead we offer high-quality wedding DJs with the skill and ability to offer a modern alternative to couples that do not want to hear songs like The Macarena or Agadoo on their wedding day. 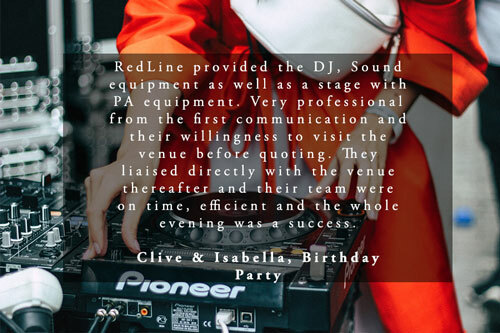 We believe that when it comes to weddings, aesthetics are just as important as any other aspect of the day, so we only use the very best equipment and keep our setup as compact as possible. 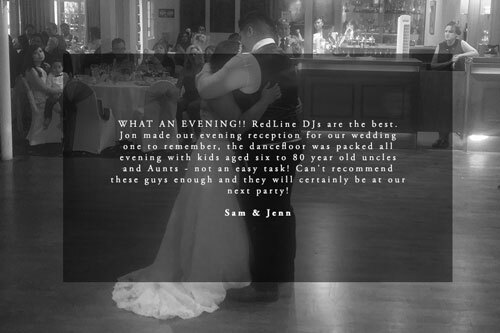 All of our wedding day packages come with intelligent ‘moving head’ lighting and a discreet DJ booth as standard. 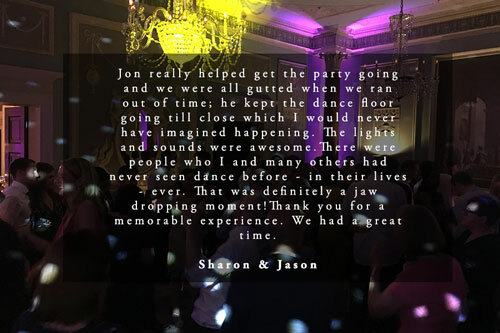 We are also able to offer additional lighting, specific colour themes and uplighting effects as added extras.